STACEY: You are travelling the world and spending time overseas which is not new to you, right? JENNY: Not at all. I spend a good part of my life in China, more than half my life these days. STACEY: Before this part of your life, had you ever been to China before? JENNY: No. 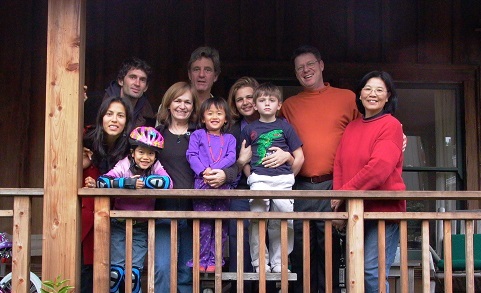 My first and only trip to China before Half the Sky was to adopt our daughter Maya. STACEY: Before Half the Sky you were a screenwriter, mother, you had two grown children. What was going on with your life before you found Maya? JENNY: I would say my life was pretty comfortable, maybe not particularly meaningful. I was an independent filmmaker and screenwriter for hire in Los Angeles. My husband is a cinematographer. We had two grown children. Our nest was empty. We had no reason to think we were going to build a family beyond that. Then we saw the photograph in the Times of the little girl who was starving to death. STACEY: Do you remember that first time you saw that picture and what went through your mind? JENNY: Oh, sure. I think I’d heard about male preference in certain parts of the world. But, I had no idea that little girls in China were being abandoned simply because they were little girls. The article talked about the really terrible conditions in the orphanages and the fact that many children were not surviving. Even though we never considered adopting, we felt like we had to do something. The typical middle class thing is to send money. But, whom do you send money to in this instance? My husband said, I didn’t say it, that we could bring one home. And, that’s what we did. STACEY: There are different crises around the world. Why did this one speak to you? JENNY: Until I wrote this book I really had no idea. I felt absolutely that this was the right thing to do at the time. When we went to China to adopt Maya, we felt we were saving a life. Instead it transformed my life. 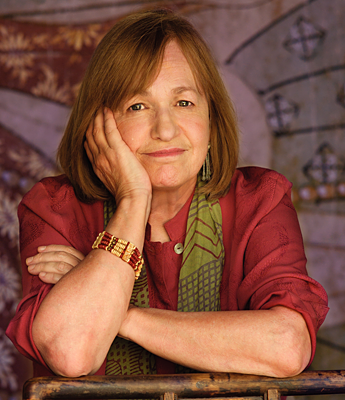 Maya came to us with pretty much all the effects of institutionalization, everything that is wrong with institutionalization. She was not quite two years old. She was malnourished, had parasites and amoebic dysentery. She couldn’t walk or talk. She was emotionally shut down. She was vacant. We saw what almost two years of neglect had done to a child; we didn’t even know what to do even though we were experienced parents. Then about a year later, we were having a party at our house. I looked out the kitchen window and there was our daughter romping around in our garden, singing and calling out to her friends, so happy and full of life and joy. She looked like a child who had been adored from the moment she was born. And, that was just in a year. I just thought that was so easy. Why don’t we just do that for all the kids we can’t bring home? STACEY: It really seems like how can you not do something? JENNY: Exactly. That’s how I felt. Honestly, from that moment I did not look back. I walked away from everything that had been and did this thing. I knew what I had to do. STACEY: Is this a rare situation or was this commonplace in the Chinese welfare system in the late ‘90s early 2000s? JENNY: At that time, it was the standard. China was really caught between the collision of the one child policy and the traditional preference for boy children. The government could not have foreseen that social policy, which was meant to control population, that so many people would choose to abandon their female children in hopes of giving birth to a son. By the late 90’s, we adopted Maya in ’97, the orphanages were just full with healthy baby girls. It was a crisis. Children who were abandoned and living in orphanages were low on the priority list. At least they were getting fed, they had shelter and some of them were surviving. Those were some of the lucky ones. STACEY: You’ve really had to educate them on ways to improve the situation. What kind of impact have you had? JENNY: The impact has been incredible. Now I consider our government partners, true partners. They have completely adopted our approach.We’ve really figured out how to transform children’s lives. The government is now very proud to be our partner and proud of what we’ve accomplished. We are now working on a 6 year initiative with the government to train every child welfare worker in the country in our approach. The impact is going to go way beyond orphanages. It’s going to be helping street children, migrant workers’ children, children taken into child slavery and trafficking and all these horrible social issues. These children will now slowly be able to benefit from the simple, basic premise that all children need to love and be loved. Without that, they cannot thrive. STACEY: In describing the conditions, there’s one photo in your book that shows these kids tied into their high chairs, potty chairs. JENNY: And, it’s not because they don’t love children. Nothing like that at all. It’s because they were overwhelmed. And, there was no training, no standard for hiring caregivers. People were just assigned to those jobs, whether or not they liked children, or had experience with children. They tied them to keep them in order so they would have some control. There would be one caregiver and 30 babies. If you’re a mom, you know what one baby can do to your day! So these caretakers were not bad people; they were not trained people. They were ignorant people. They were not given any resources beyond the basics. STACEY: So, the Half the Sky concept and organization filled that void. JENNY: Yes, it certainly did, although I can’t pretend it was immediately recognized as the solution. It was a long haul. JENNY: It’s an old Chinese saying that women hold up half the sky. It’s attributed to Chairman Mao, even though many say it was said long before him. When we brought our daughter home, 95% of the children living in the government orphanages were little girls. We wanted to help them hold up their half of the sky. STACEY: Did you have any idea how to create your own organization? JENNY: No. I was utterly unqualified. I didn’t speak a word of Chinese. I’d only been to China once before and that was to adopt. I never thought about starting a nonprofit organization, an NGO. I had never dealt with a government bureaucrat. All I knew about child development was what mothers know. I had no qualifications except that I was a filmmaker and a screenwriter and I knew what to do with a blank piece of paper. I knew what to do with nothing. I could imagine a world that didn’t exist and I could imagine how to make that world happen. I could imagine a happy ending and how to get there. So, it’s really like I’m making a movie and I’ve been in production for the last 16 years. STACEY: You also have Anya, now. How have these children changed your life? 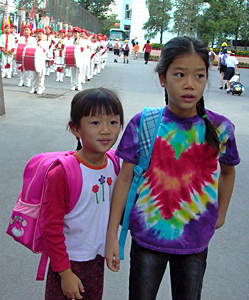 JENNY: My two girls, who are now 18 and 16, are living proof that nurturing care can transform a child’s life. They are doing great and I am just a lucky mom, just an ordinary lucky mom. 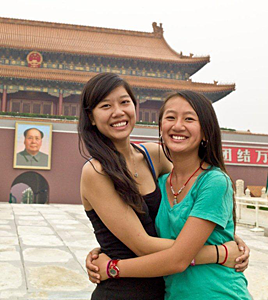 STACEY: What kind of resistance did you get when you stepped foot into China and said, “This is what I want to do.” Were they receptive to you? JENNY: No. But, they knew something had to happen. There had been a lot of international criticism just before I got there. There was a documentary called The Dying Rooms that tried to expose the dark secrets in Chinese orphanages. Then there was a Human Rights Watch report that was actually the reason that I saw that photograph in the New York Times. It was attached to an article called Death by Default Policy of Fatal Neglect in China’s Orphanages. They were under so much international criticism. The Chinese did what most Asian cultures will do; they will smile and say, “Thank you for your comments.” And, then they will close the door and you can never get in there again. By the time I got there, the doors were closed to foreigners. STACEY: So, how did you get in? JENNY: Well, as a filmmaker, you always find a way. I just talked to everybody. I finally just found somebody who found a half-Chinese, half-German advertising executive who had a contract with a Chinese NGO. He made an introduction that got me the introduction that got me the introduction that got me the introduction that got me in the door. That’s very much the way China works, probably a lot of places work. STACEY: What can we do? What do you tell people who want to help, who want to try something like this? STACEY: I want to thank you, Jenny, for joining us today. 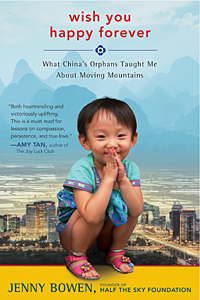 The book is Wish You Happy Forever: What China’s Orphans Taught Me About Moving Mountains. Good luck with this book. And, continued success to you and Half the Sky Foundation. 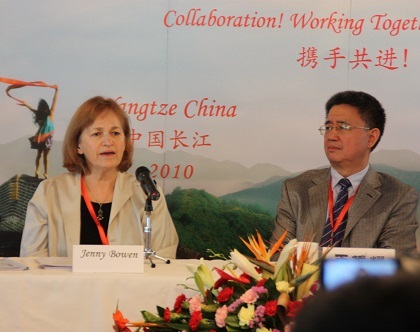 TWE: You can hear more from Jenny on how she plans to reach every abandoned child in China and how her model can be used in the U. S. by listing to the podcast here.